You can transform your interior to a like new look easily and affordably yourself with no experience required. A complete transformation of your car’s interior from rear seat to steering wheel. Polyester and PU Leather covers come in 5 distinctive designs; Broken, Wide, Y and H, Stripe, and Solid Black. Add style, durability and protection to your car seats with this car seat cover set designed to work with built in seat belts. These adjustable covers feature hook-and-loop fasteners for easy installation. Seat covers easily fit most models of Cars, Trucks, SUVS, and Vans. Instillation can be done at home by following the easy-to-follow directions. No costly professional installation is required. Steering wheel cover easily fits all standard models. 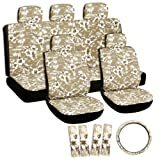 Increase the value and look of your Car, Truck, SUV, or Van with this 17 piece set of seat and steering wheel covers. Transform your worn and torn interior into a new car experience with this high quality made materials. General wear and tear along with stains, rips and gashes can make your vehicle’s interior not only unsightly, but uncomfortable and embarrassing. Our Polyester or PU Leather Seat Covers are machine washable (delicate cycle) or can be spot cleaned to ensure that spills and stains are easily removed with the convenience of a simple wash. Easy to remove seat covers can be laundered at home. These stylish seat covers will spice up your car, help keep your seats clean, and help decrease road fatigue. Let me guess, you want quality too? With OxGord Seat covers, you really can have it all.